Your Doteasy Cart Notification Emails include: New user registered, New order, Password reset, and Email to a Friend. 1. 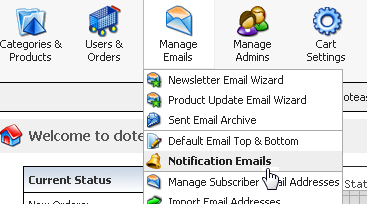 Click on the Notification Emails option under the Manage Emails menu. 2. Click on the Edit Email Template icon for the Notification Email you want to edit. 3. The Edit Email Notification page will open. 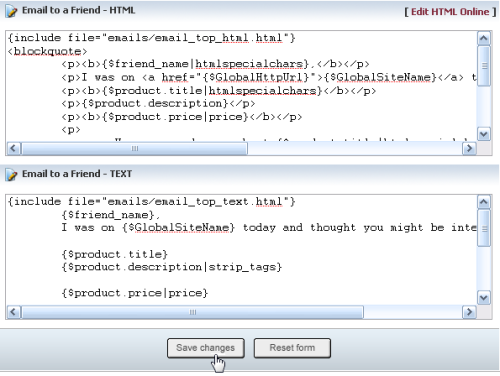 Click on the respective boxes (HTML and TEXT) to edit the template for that notification. 4. When you are ready, click on the Save Changes button.